As one of the largest and most imposing presences in all of film history, Marlon Brando remains the standard-bearer for American film actors. Whether they worship him directly or those he influenced, Brando was the consummate actor’s actor; the guy everyone wanted….or wanted to be. Yet his reputation moved slowly but steadily downhill from more or less the moment he sent Sacheen Littlefeather to the Academy Awards to accept – or rather, refuse – his Best Actor award for “The Godfather”. Like Orson Welles before him, Brando’s outsized personality and frequent antics later in life have made it nearly impossible to have two fond thoughts of him in a row. Nevertheless, for as much as we are at war with our opinion on Brando, the war which Brando was constantly at with himself is of a significantly greater magnitude. 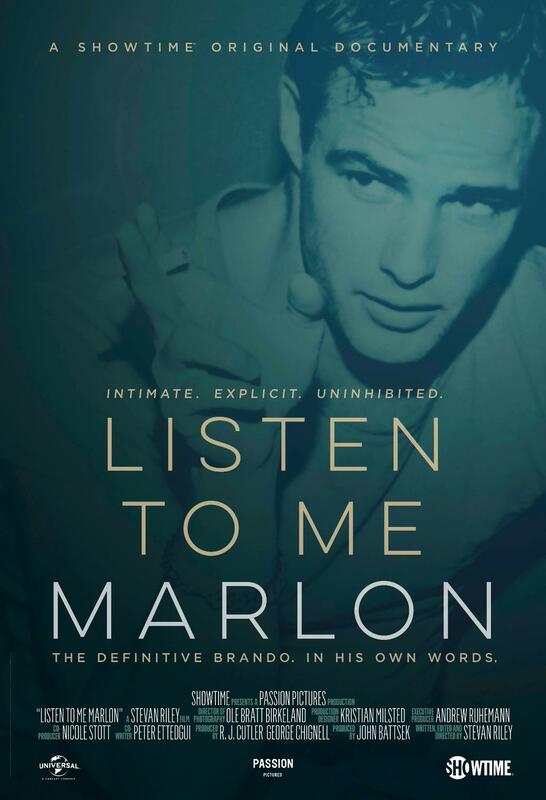 The new documentary “Listen to Me Marlon” seeks to let Brando do all the speaking for himself in an interesting, if unoriginal, narrative device. Making use of nearly 2,000 hours of recorded thoughts, insights, ramblings, and some technological strangeness, director Stevan Riley‘s film allows Brando himself to do a post-mortem on his life and career. If that structure makes you think of 2003’s masterful “The Kid Stays in the Picture”, you’ve got a decent idea of what this film is like, but the more serious nature of this film’s subject lends it a gravity that Robert Evans just can’t be expected to bring to his film. Spending the bulk of its running time devoted to the early life and career of the actor, the film unfortunately doesn’t give itself enough time to devote to anything not already covered in one of the biographies about Brando’s life. I nevertheless recognize that not everyone has time to read 1500+ combined pages about Brando, so using this as something of an introduction to the actor was the smarter way to go. His equally troubled – for equally diverse reasons – relationship with his parents is touched upon several times, but the film gets right to the meat of the story, which is basically “When Marlon met Stella,” Stella being Stella Adler, the patron saint of method actors everywhere. 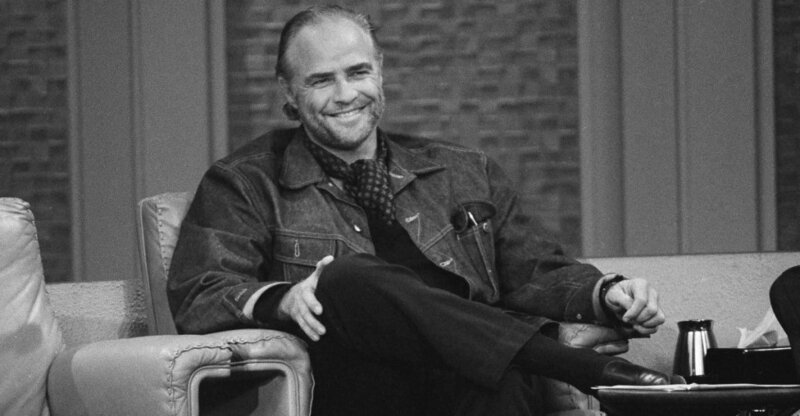 One of the film’s highlights is seeing vintage footage of Adler teaching classes and doling out impassioned monologues about how the actor is “the boss” on a set or a stage. This makes Brando’s later behavior much clearer, but here to is Brando’s war with himself at work. His slavish devotion to Adler’s teachings lead him to deride 1940s Melodrama while simultaneously being completely oblivious to how foolish he looks underplaying a character like Sky Masterson in “Guys and Dolls”. Even still, it becomes plainly obvious that although Brando didn’t event the notion of method acting, he showed through his work the true power of the technique to the average person. Brando’s Oedipal complex – dealt with in both Peter Manso’s biography and Brando’s own aptly titled Songs My Mother Taught Me – is dialed back considerably in the film. Save a brief reminiscence of his mother, she’s almost wholly absent from the film, and I imagine this was done to make that relationship palatable to a mass audience. In fact, the film seems to touch more on Brando’s relationship, or lack thereof, with his father and how that affected him as a father later in life. Again, this all speaks more to the folly of attempting to cover such a vast span of time and broad number of subjects within his own life in only 95 minutes. One indulgence the film doesn’t shy away from is Brando’s rampant womanizing, a word I normally hate but feel is appropriate in this context due to Brando’s own treatment of women as objects of either sexuality or pain, sometimes simultaneously. There’s a nice montage of him wooing women on camera in films, during interviews, and all the while Brando’s talking on the soundtrack about how an actor needs to be a con man. This kind of elegant blending of images with related themes in Brando’s reminiscences helps to keep the film moving at all times. The real problems for the film start in the third act. Riley chooses to cram the incarceration of Brando’s son, the suicide of his daughter, and his entire post “Apocalypse Now” filmography into a ten minute chunk of film near the very end. The film’s prior boast about the thousands and thousands of hours of audio recordings leads one to wonder if Brando may have abandoned recording during that era or if Riley just deemed this material not worthy of inclusion. Either way, it feels like a lesser film as a result, but not one worth writing off entirely. In fact, a terrific companion piece for the film is last year’s remarkable “Lost Soul: The Doomed Journey of Richard Stanley’s Island of Dr. Moreau.” Knowing Brando as well as one does after viewing this film will help to make your enjoyment of Brando’s late life antics much more rich. More than anything else, “Listen to Me Marlon” will make Brando fans eager to revisit all of their favorite Brando films from “On the Waterfront”, “A Streetcar Named Desire” and “The Godfather” and whichever one of those Christopher Columbus movies he was in. That, in my estimation, makes it a success by any measure. It likely could have worked better in a longer format, perhaps a television miniseries, since I think Brando is a fascinating enough character that I could have sat through at least another hour of this film. “Listen to Me Marlon” is not essential viewing for fans of the actor and those who are well versed in his many complexities. If you’re wet behind the ears or, better yet, are a Brando fan that knows someone who is, this would make a fantastic introduction to this marvelously mysterious man.